Within three years of founding Corporate360, a big data software company with just five persons, the company now employs 50 people with revenues. KOCHI: A college dropout and son of a head-load worker is scripting a startup success story in Kerala, in the rural settings of Pathanapuram in Kollam district. Within three years of founding Corporate360, a big data software company with just five persons, the company now employs 50 people with revenues nearing double digit million dollars. Importantly, Corporate360’s client profile includes 17 names from the Fortune 500 list such as Dell, HP and Oracle. 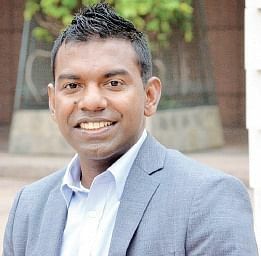 What makes Corporate360’s journey so far very significant is the story of its founder Varun Chandran, whose dream was to make a career in football. Things, in fact, were moving in that direction - he represented the Kerala football team in sub-junior, junior and the university football team from 1997-2000, during his college days at MG College, Thiruvanthapuram, thanks to the scholarship by the Kerala government for his football skills. However, destiny had different plans. Varun got injured on the football field, leaving him with little money to pursue his studies. Short of cash, Varun let go his studies and football career hopes, and left for Bengaluru in search of a job. The startup plans to expand operations and increase the headcount to 100 people. The company's new facility is ready. "Efforts are on to bring Chief Minister Pinarayi Vijayan to inaugurate the new building," informs Varun. To scale-up the startup, Corporate360 is also looking for funds to the tune of $3 million. "We are in talks with several big names including the Singapore government for this. We have only one condition, we will not shift our operations from Pathanapuram. It's my commitment to my home town," he says.